Though our bedrooms were spread out across the Treasure Valley, most of us woke up around 3:00 am this morning. We met at the airport at 4:45 am and the day was thankfully shaped by all the things that did not happen. We did not miss our connection in Seattle, Alaska Airlines did not lose our luggage, and although we circled a few times over Detroit because of a storm, we were not delayed. Also on our Seattle to Detroit flight were members of St. Mark’s Lutheran, Spokane and groups from Beaverton, OR and Bothel, WA. The Gathering volunteers and Detroit’s transportation staff were welcoming and incredibly well organized at the airport. We were directed to a shuttle bus which took us to a large staging parking lot. We boarded the next shuttle bus, which would take us to our hotel, just before the rain started to fall. Another group headed to Livonia was supposed to share our shuttle but eventually our bus driver told the coordinators that we’d been waiting for over and hour and he wanted to take us to our hotel. How did we pass most of that time? Testing one another with riddles, of course. The day concluded with hotel check-in, a supper of pizza and chicken wings, and, for some of the group, a trip to the pool. There are 400 Gathering participants in our hotel, making up about 90% of the hotel’s guests. We have only two Hotel Life volunteers but they are friendly and have a plan in place for the morning shuttle process about which they are optimistic. 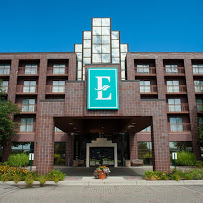 Our home for the Gathering–Embassey Suites, Livonia, MI. Yes, we are in an outlying property, but we are safe, quite comfortable, and we’ve been assured by our Hotel Life volunteers that breakfast is fabulous–good news when traveling with five teenage boys.